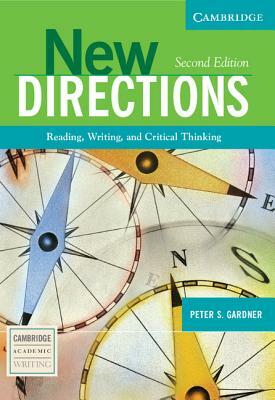 New Directions, Second Edition is a thematic reading-writing book aimed at the most advanced ESL learners. The Student's Book prepares students for the rigors of college-level writing by having them read long, challenging, authentic readings as a precursor to writing. This emphasis on reading gives New Directions its distinctive character. Each of the five topic-based chapters contains three core readings and five additional readings. The readings come from a variety of genres and are accompanied by exercise material. The second edition represents a major revision. It contains two entirely new chapters and many new readings and activities in the other three. Another significant new feature is a section at the end of the first chapter that takes students through the writing process. Students work through it for their first writing assignment and return to this thorough treatment of the writing process for each subsequent major writing assignment. Author Name: Gardner, Peter S.